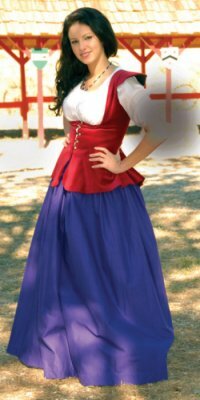 Walk through the Renaissance Faire wearing this complete garb set and heads will surely turn! We've paired our Cotton Velveteen Bodice, Gathered Peasant Skirt, and Chemisette into a stunning combination. Our under-the-bust Cotton Velveteen Bodice features a button up front with back lacing which allows an ease of adjustment in the fit. Made of cotton velveteen in your choice of the colors listed above, ordered by your natural waist measurement. Made of cotton, our Chemisette will be a blessing on hot days! Features a drawstring neckline and three-quarter length sleeves trimmed with ruffled cuffs. 100% cotton. The Gathered Peasant Skirt is made of soft cotton that mimics the weave of linen without the expense. A double set of lace holes in the back of the waistband allows for adjusting the fit should you lose or gain weight. The extra-high waistband is superior to elastic waistbands because it helps to keep the chemise or partlet tucked in all day. You'll never look disheveled. Shown: Our Cotton Velveteen bodice in Burgundy (Rouge), our Chemisette, and our Gathered Peasant Skirt in purple.